Published on April 4, 2011 in Career Management Tips, Goal Setting and Leadership. 0 Comments Tags: Being On Purpose, Career Development, Finding Your Calling, Motivation, Outcome Driven. I come from a family that valued higher education, hard work and integrity. I can’t say that it’s all that common these days. One of the foundational principles I was brought up with was the understanding of the hierarchy shown below. 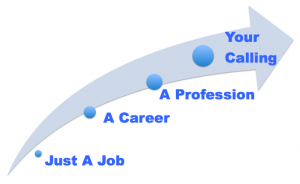 This Professional Mastery Blog is all about helping you migrate from having ‘just a job’, to developing a great career, accelerating in your profession and ultimately finding your calling – the reason you’re here and the only way you get to feed your spirit living the dream life you’ve always wanted.